Beginning, middle and end. Aristotle figured it out centuries ago and the rest of us are simply repeating his work with new fangled terminology, right? Far from it. Story structure is not simply opening and closing images, midpoints, dark nights of the soul, three acts that break at 30-60-90, spiritual transformations, progressive complications, whammies and reversals. These are all storytelling devices. They add flavor to a solid story structure, not meaning. This is why they don’t apply to every story, why the order in which they appear shifts, and why so often they seem like matters of interpretation. Their use varies depending on the individual style of the writer. In a recent presentation writer/director Guillermo del Toro made mention of his disdain for story structure and for the familiar systems propagated by the Robert McKees and Blake Snyders of the world. Reiterating his analogous comparison between the competing writing philosophies of the structuralist and the naturalist to that of tourist and traveler, he began to expand on his particular approach to writing. A tourist arrives on scene with a set itinerary, a list of popular sites to visit and a schedule within which to visit them. A traveler, on the other hand, experiences the foreign land with little to no boundaries, and no presumptions about what the trip will entail. Preferring the latter, del Toro explained that he would much rather experience “diarrhea in a corner” rather than burden himself with the expected. The allure of the wandering minstrel, of the romanticism involved with not knowing one’s path, runs through the genetic code of any writer and of any artist. Who wants to be told what to do when creating? The problem with this analogy lies in an all too familiar misconception of story structure. Story structure exists to convey and support an Author’s argument, not to stipulate a framework of fifteen familiar beats. In that same presentation, somone asked del Toro if the themes of disobedience and choice clearly present within his masterful film Pan’s Labyrinth were subject matter that he intentionally set out to write, or if they were simply happy accidents he discovered along his travels. Without skipping a beat he answered confidently that yes, the problems of disobedience or rather lack of disobedience, were guiding lights in some of the decisions he made when writing the original screenplay. When an Author sets out to say something, to prove something to a willing audience, he or she is using story structure. Utilizing character, plot, theme and genre, an Author sets out to argue a particular point-of-view. The success of a story depends on how much the Author aligns their work with the natural problem-solving processes of the human mind (mentioned in the last article The Real Magic Behind Great Stories). The more “broken” or stilted this process is, the weaker or more meaningless a story becomes. Pan’s Labyrinth works because Guillermo del Toro was trying to say something about the unquestioning allegiance to authority. When arguing a point, particularly when a writer can’t be there to answer any counter-arguments (as in the case of a film delivered to a wide and international Audience), it becomes necessary to cover all the bases. In story, this completeness of argument comes by exploring the four different contexts—I, You, We and They. These equate, respectively, to the Main Character in a story (I), the character who challenges their way of seeing things (You), the relationship that develops between the two (We), and the big picture story involving all the characters (They). Arguing only one side of the argument or only some of the perspectives leads to a story that feels pointless or lightweight. Thankfully Pan’s Labyrinth does not suffer from this, leaving many an audience member satiated and emotionally fulfilled. An exploration of del Toro’s 2006 fairy tale classic begins with young Ofelia (Ivana Baquero). Seated at the emotional center of the story, she fulfills the first perspective on the problem, that of the Main Character. Through her eyes we experience what it would be like to be a slumbering Princess tasked with completing three important trials. Diametrically opposed to her sits the fantastical creature, Pan (Doug Jones). He challenges the way Ofelia sees herself, manipulating her growth of character by presenting her with opportunities to act the way one of her nobility should. Together they form a relationship and the third perspective on the story’s problem. It is within this context that one can begin to see the inklings of the argument. At first following orders without question, Ofelia gradually, but resolutely, begins to oppose Pan’s demands. Her experience with the Pale Man, of opening a different door and eating the food she was explicitly told not to, keys an Audience in on the film’s message and the writer’s purpose in telling this particular story. Contrast this with the fourth and final perspective, that of the adults and the Spanish Civil War, and the story’s argument becomes all too clear. While Ofelia’s experience with Pan gives an Audience a subjective look into the problems faced when not questioning authority, it is through the battles between the Facists and the Rebels that we begin to see those problems from an objective third-person perspective. As the Doctor (Álex Angulo) so clearly points out in his rain-soaked scenes, he is not like the evil Captain Vidal (Sergi López). He does not follow orders without question. Again, more clues to the Author’s argument. Four perspectives, four familiar contexts (I, You, We, They) on a single problem—in this case, an overabundance of trust. 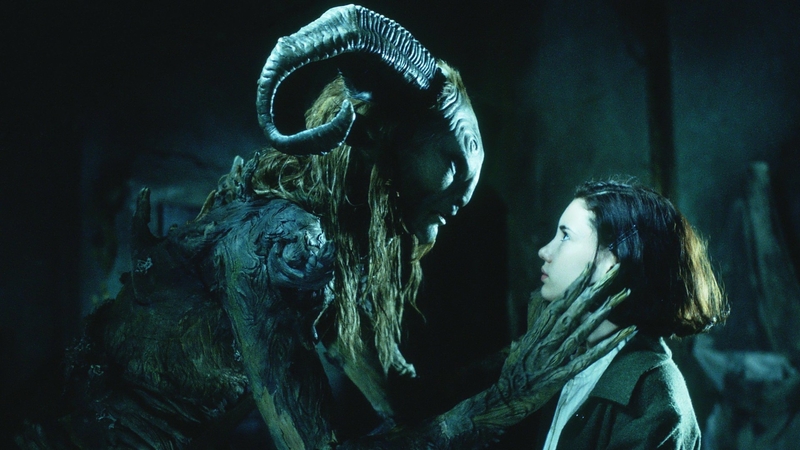 The ending of a story acts as a clue towards the Author’s original purpose in setting down those first words.Pan’s Labyrinth argues that only by repudiating the voices of authority can one find triumph. Evident in Ofelia’s final gold-laced scenes, her act of defiance against Pan guaranteed her life-everlasting with both father and mother. If she had continued to do things the way she always had, following orders without question, the outcome would not have been as fulfilling. And, as if to hammer home his position on the importance of disobedience, del Toro offers the same in the bigger picture, albeit with a grace and subtlety of expression that eludes most contemporary American filmmakers. Problems begin in Pan’s Labyrinth when Captain Vidal’s son arrives with step-daughter in tow. Without Ofelia’s presence and the matching focus of attention on her threat to the baby’s natural progression as heir of Vidal’s reign, there would be no story…no problem to solve. Ofelia’s first interaction with Vidal functions as the first fallout from this Inciting Incident. Pursuing the successful resolution of the Story’s Goal—a continuation of power flowing from grandfather to father and father to son—is Vidal himself, placing himself firmly in the role of Protagonist. While at first glance this may seem an unnatural choice, especially considering his villainous tendencies, impartiality must supplant value judgment when assuming the objective look at a story’s problem. The story introduces a problem and the Protagonist works to resolve it; good and evil have little to do with it. This is why Vidal’s eventual comeuppance feels less like a triumphant Hurrah! worthy of the halls of the Throne Room scene in Star Wars or the deck of the aircraft carrier in Top Gun, and more like the bittersweet successes found in The Lives of Others or Michael Clayton. Mercedes (Maribel Verdí), and her merry band of Spanish rebels, have prevented the successful resolution of the story’s central goal. Vidal’s son will never know his father’s name, the continuation of power will no longer exist. The Protagonist has failed. Proof of this lies in his final act of violence against Ofelia. While Ofelia eventually grew to a point where she could stand up and test those beliefs once held true, Vidal continues to act without question. Believing all along that Ofelia’s intentions were to kill his only son, Vidal had no choice but to shoot her. Instead of seeing the fruits of overcoming the story’s problem, the Audience bears witness to what happens when the problem persists. Subjectively we see the joy that comes from questioning a previously held belief, objectively we see the failure that comes from not questioning. The combination of the two supplies a resonance of meaning unheard of in lesser films. Effective story structure developed and finalized the original argument Guillermo del Toro set out to make. It was not an after thought. Seeing story structure as a mechanism for providing meaning, for supporting an Author’s argument, flows effortlessly from that initial spark to create. Most writers of narrative fiction write because they want to create something that has weight, something that is greater than the sum of its parts. This intangible extra benefit they seek with their work comes as a result of giving an Audience something they can’t get in their day-to-day lives: a look at problem solving both from within and without, objective and subjective. Whether they realize they are doing so or not, writers who write with purpose utilize structure to relay their message. They may be traveling, but there is always a reason why they originally chose the path. The more familiar understandings of story structure, as propagated by Snyder and the Hero’s Journey advocates of the world, make no mention of supporting an Author’s purpose in writing. They feel more like a didactic exploration of familiar cultural hotspots rather than a helpful shaman along for the trek. It is structure as seen from the eyes of the Audience, an unfortunate reality that will often feel like an imposition on a writer’s natural sensibilities. In that respect, these paradigms of story will always feel like a tourist trap. In three of the four throughlines, Trust functions as the Problem. Defined as an acceptance of knowledge as proven without first testing its validity, this element works perfectly both for Ofelia’s personal throughline, her tenuous relationship with Pan, and for the Overall Story Throughline. Test would therefore be the Solution. In Ofelia’s throughline we see a successful resolution (more accurately a Story Judgment of Good) when she stands up to Pan and refuses to hand over the baby. We don’t see it in Vidal’s efforts to continue his bloodline. He shoots Ofelia without question, and the story ends in Failure. The bittersweet feeling present at the end of the film occurs because of the combination of these two aspects of story structure. A Failure/Good story is one of Personal Triumph, an accurate and meaningful description of the film’s ending.